Spaetzle is Germany’s favorite homemade pasta. It’s surprisingly easy to make spaetzle from scratch. Then you can mix the tender noodles with caramelized onions, wilted greens and gruyere cheese to make this scrumptious comforting casserole. Since the inspiration for this recipe came on a morning dog walk, I’m going to introduce you to my dog Baxter. He’s my good buddy and I adore him. Every morning we walk or run together. We have our usual haunts where he meets up with his friends and I meet up with mine. 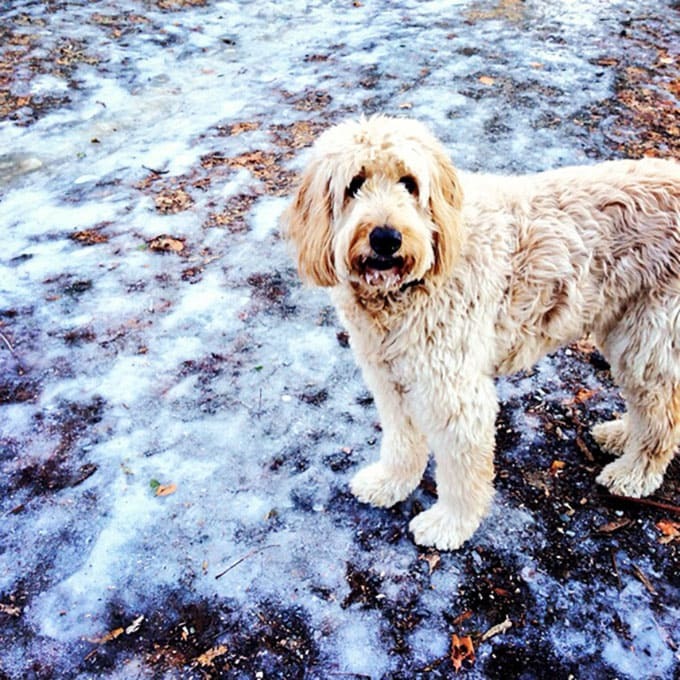 Recently, on a ridiculously cold and icy day, we ran into a fellow Golden Doodle named Merlin. While the dogs were romping around, Merlin’s owner and I got to talking. I found out that she’s German. She told me her son was home from college for winter break and that she cooked spaetzle, his favorite food. As she was describing the buttery, cheesy casserole of tiny tender dumplings I knew what I had to do. 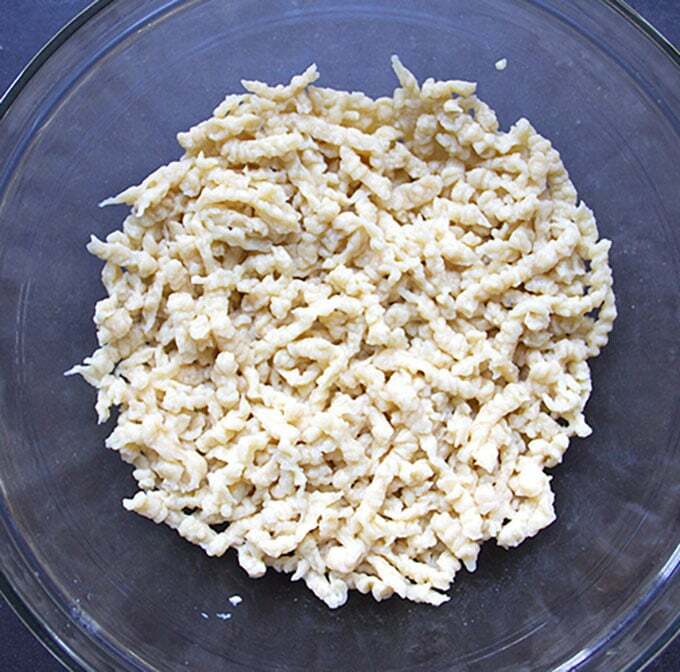 Spaetzle is a cross between pasta and dumplings. The dough is a mixture of flour, eggs, milk or water, and salt. You can spice it up with nutmeg, black pepper or any herbs that you like. The dumplings are formed by pressing the dough through holes and into boiling water. 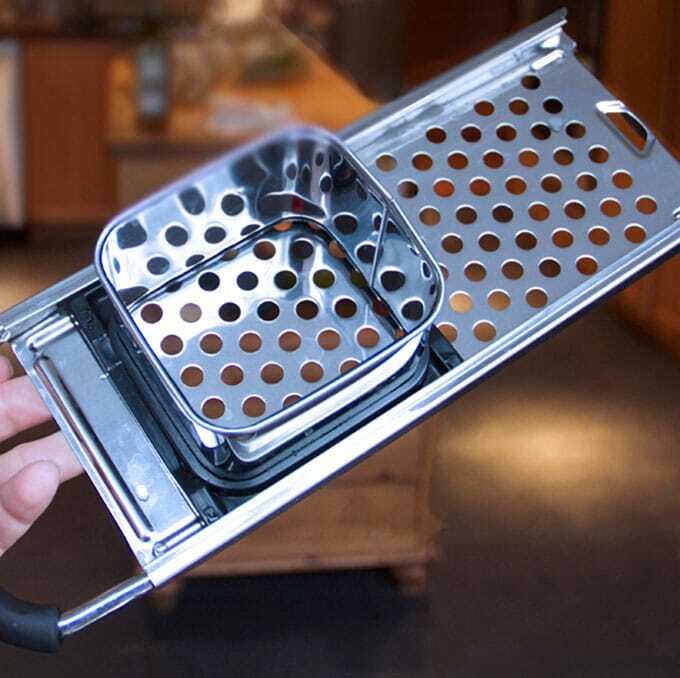 You can use a flexible spatula to press the dough through the holes of a colander, steamer or anything you have around that has small holes. Or you can use a spaetzle maker like this one. Just put the dough into the chamber and as you slide it back and forth, the sticky dough is forced through. The blobs of dough fall into boiling water, where they cook for 3 minutes. 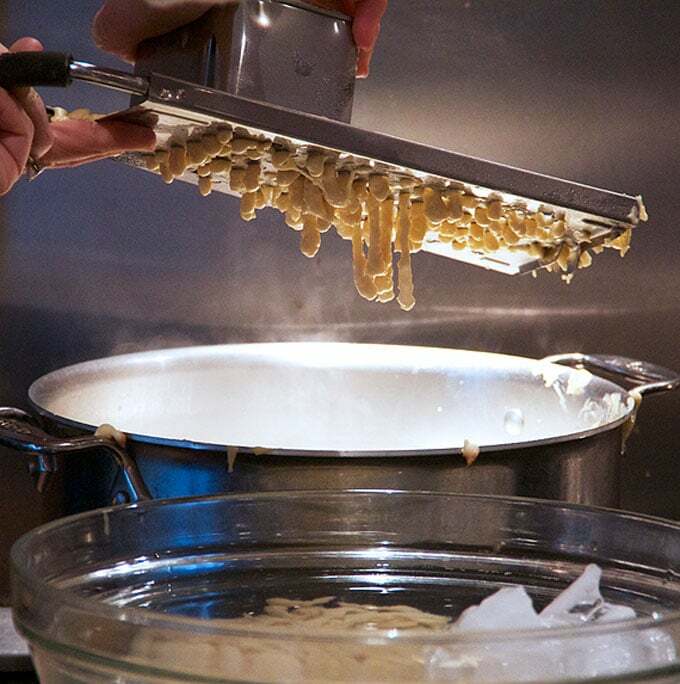 The cooked spaetzle are transferred to an ice bath to cool them down and prevent over-cooking. 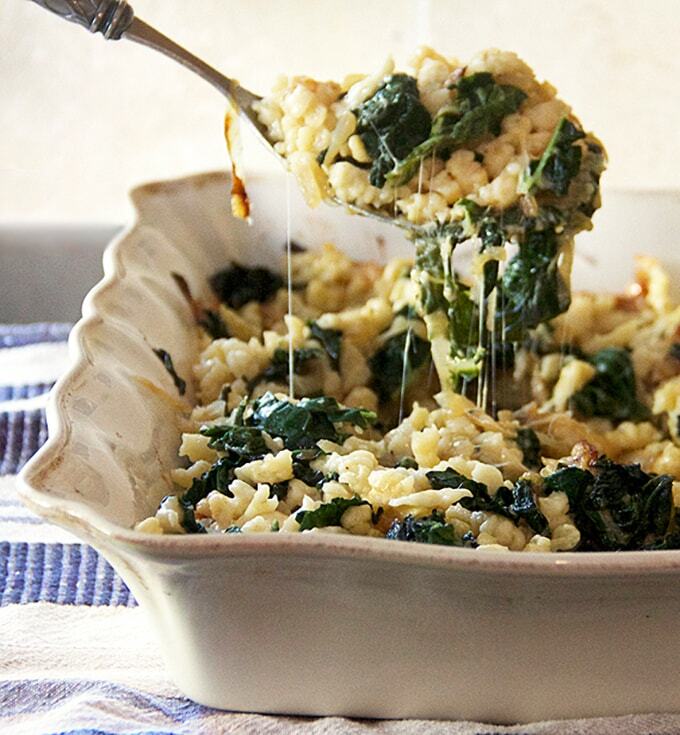 There are many ways to eat spaetzle. It’s a perfect side dish for soaking up the juices of a saucy stew or goulash. It’s also delicious browned in butter in a skillet with herbs or cooked in a casserole with butter and cheese, which is a common German preparation. I went with the German mac ‘n cheese version, adding caramelized onions (one of my all time favorite ingredients), grated gruyere, and wilted winter greens (for something healthy and colorful). 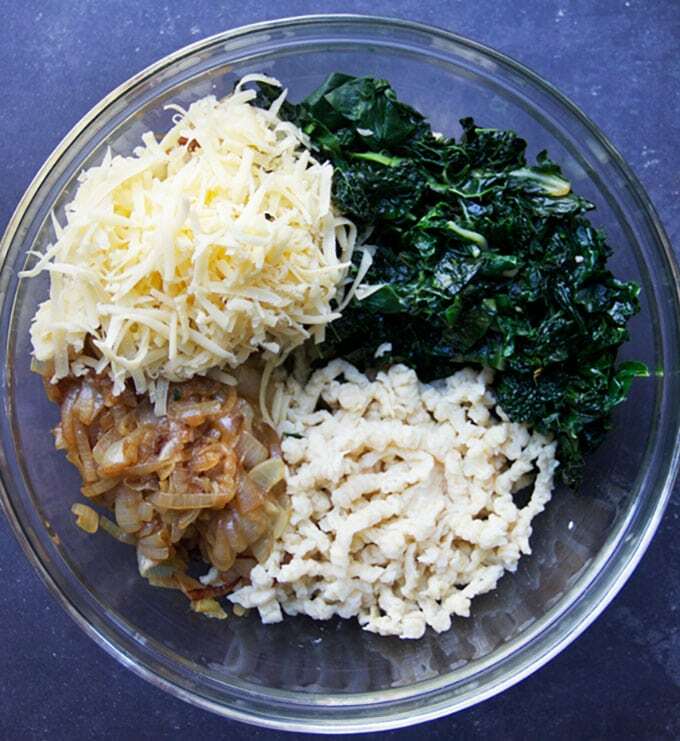 I used kale and chard in my casserole but you can substitute your favorite greens. Here’s a helpful guide to greens by Cooking Light. I have to confess, if I could eat anything I wanted without worrying about my weight or my health, it would be macaroni and cheese and lasagna every day. 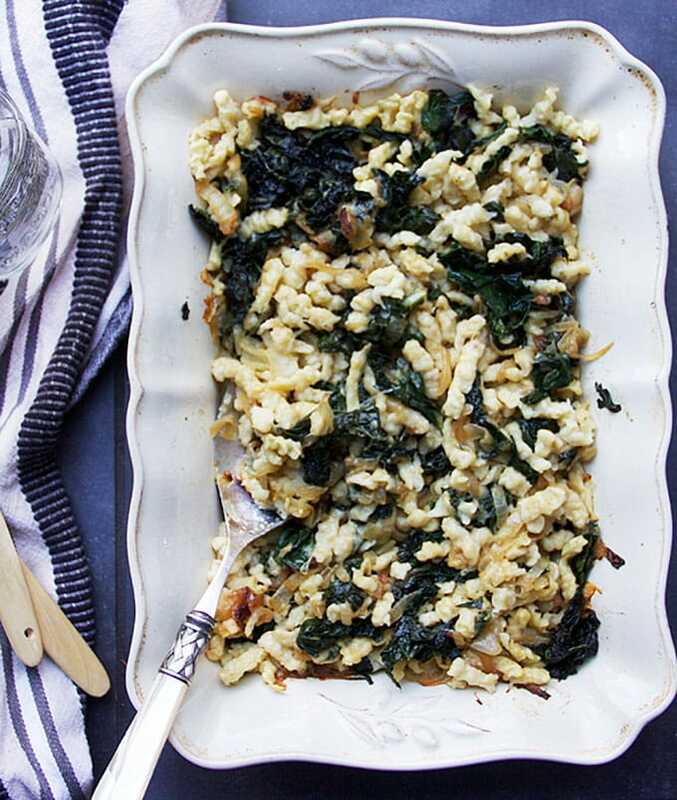 This spaetzle with caramelized onions, wilted greens and gruyere is my German-inspired version of tasty, cheesy comfort food, with a healthy twist. I hope you enjoy! 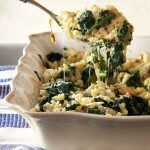 A casserole of tiny tender dumplings with sweet onions, winter greens and melted cheese. 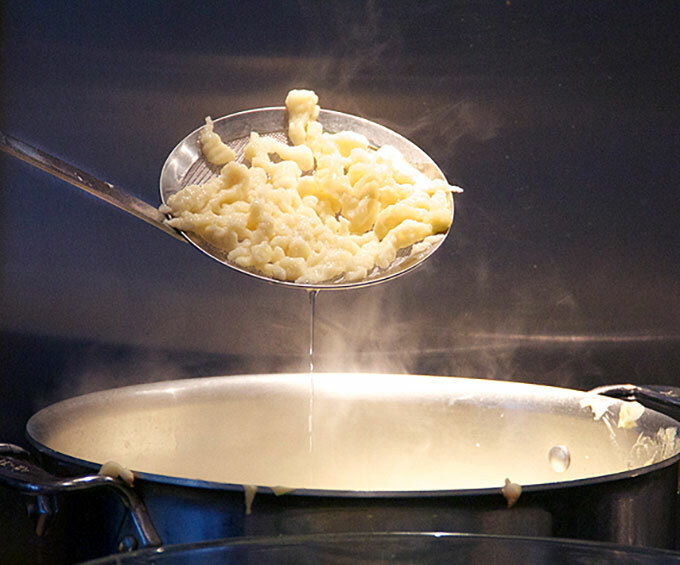 Make Spaetzle In a large bowl, whisk or beat eggs until they start to get foamy on top. Stir in milk. In a medium bowl combine four, salt and pepper. Add flour mixture to eggs a cup at a time, stirring until just combined. (over-working the dough makes it tough) You will have a fairly firm batter. If it’s too firm and not sticky at all, add a bit of water. Don’t worry if it’s not perfectly smooth. Bring a large pot of salted water to a boil. Working with 1/4 of the batter at a time, hold the spaetzle maker over the pot and slide the cup back and forth, allowing the dough to fall into the water. You may need to use a knife to help release the dough. Allow it to boil for another 2 1/2-3 minutes. Using a skimmer or a slotted spoon, transfer cooked spaetzle to the ice bath. Repeat three more times or until all the batter is used up. Once the ice has melted, drain the spaetzle. Put it in a bowl and toss with 1 tablespoon olive oil. At this point you can store it in the fridge, covered, for a day or so before proceeding. 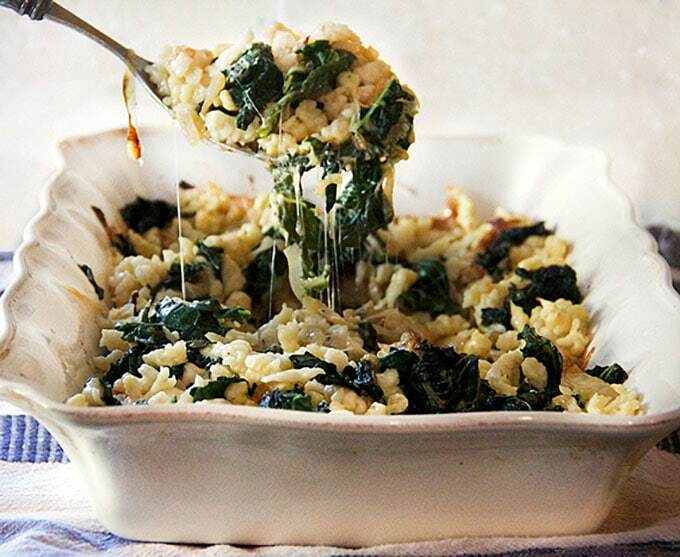 Assemble the dish In a large bowl toss spaetzle with wilted greens, caramelized onions and grated cheese. Season generously with salt and fresh ground pepper, to taste. Pour the whole mixture into a lightly oiled 9 x 13 inch casserole. Bake in the oven for 20-25 minutes, until heated through and cheese is melted. We are making Potatiskorv today, and I thought spaetzle would make a great side for it. I was seeking a recipe that was more than just plain or cheesy. This looks like the perfect dish! I can’t wait to try it. Thanks! I made spaetzle once about 20 years ago and haven’t made it since. It was probably b/c I was at a friend’s house who had a spaetzle maker. I’m not a gadget fan but I think I may have to invest after reading this really yummy dish. Thanks, Lisa! Oooh, that looks amazing! After so many years living in Switzerland, I think it’s finally time to buy a spaetzle maker!